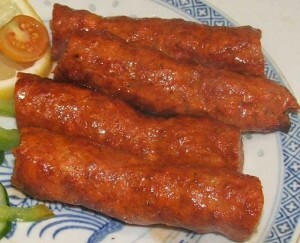 Shah Jahani Kebabs recipe by Mariam at PakiRecipes.com. Cut the beef into 4cm cubes, chop the chilli fine, grate the ginger and crush the garlic . Put the beef into a bowl, add salt , ginger , garlic and chilli and mix well. Leave covered for an hour. Add yoghurt and garam masala and leave covered for 2 hours longer. Thread the beef cubes, about four at a time, onto skewers. Grill, or babecue, for about 710 minutes, turning so that all sides of the meat are evenly cooked. Brush once or twice with the marinade. Serve on a bed of rice or with naan. this food look s very yumeeeeeeeeeeeeeeeeeeeeeeeeeeeeeeeeeeeeeeeeeeeeeeeeeeeeeeee ahahahaha!